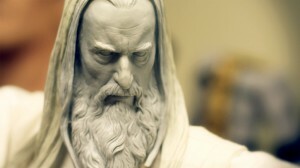 Sideshow Collectibles have released a production sneak-peek at the next items to be released in their The Lord of the Rings Premium Format line. Joining the ranks of the amazing 1:4 statues is a statue of the role played perfectly by Sir Christopher Lee, which is none other than Saruman the White. No word on when this will be up for order but we did get this amazing video showing what is in-store for all of us. Once we get more information we will pass it on to you.